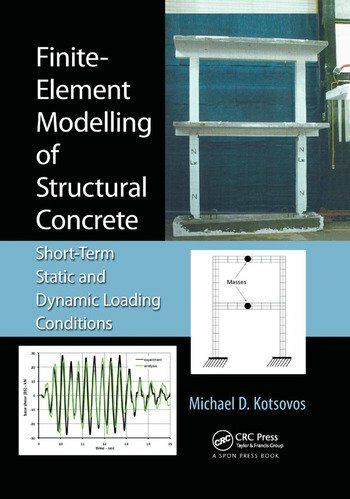 Finite-Element Modelling of Structural Concrete: Short-Term Static and Dynamic Loading Conditions presents a finite-element model of structural concrete under short-term loading, covering the whole range of short-term loading conditions, from static (monotonic and cyclic) to dynamic (seismic and impact) cases. Experimental data on the behavior of concrete at both the material and structural levels reveal the unavoidable development of triaxial stress conditions prior to failure which dictate the collapse and ductility of structural concrete members. Moreover, and in contrast with generally accepted tenets, it can be shown that the post-peak behavior of concrete as a material is realistically described by a complete and immediate loss of load-carrying capacity. Hence rational analysis and design of concrete components in accordance with the currently prevailing limit-state philosophy requires the use of triaxial material data consistent with the notion of a fully brittle material, and this approach is implemented in the book by outlining a finite-element method for the prediction of the strength, deformation, and cracking patterns of arbitrary structural concrete forms. Numerous examples are given that show both the unifying generality of this proposed approach and the reliability of the ensuing numerical procedure for which the sole input is the specified uniaxial cylinder compressive strength of concrete and the yield stress of the steel. This not only offers a better understanding of the phenomenology of structural concrete behavior but also illustrates, by means of suitable examples, the type of revision required for improving design methods in terms of both safety and economy. Using relevant case studies throughout, Finite-Element Modelling of Structural Concrete: Short-Term Static and Dynamic Loading Conditions focuses on the realistic modeling of structural concrete on the basis of existing and reliable material data and aids in the research and study of structural concrete and concrete materials. Michael Kotsovos is a senior research fellow, and former professor and head of the Structures Department, at the National Technical University of Athens. He was formerly a consultant to Jan Bobrowski and Partners; Rendel, Parmer and Tritton; and Taywood Engineering in London; followed by several years as a lecturer at Imperial College London, UK. "This book provides a comprehensive and reliable treatment of the finite element analysis of reinforced concrete structures on the basis of well-founded material properties adopted on the basis of experimental results after a critical evaluation by the author according to his personal research. The strictness of the approach regarding the effective triaxial concrete behaviour forms a safe basis for the development of the finite element procedure in analyzing various reinforced concrete structures under static and dynamic loading including the seismic design."